Look around your home. You’re sure to find plenty of walls you’ve decorated and beautiful displays throughout. But, what about your interior doors? In many residential properties, these are some of the most undervalued and even rarely considered components to a home. But, when you choose different doors, perhaps those with a few embellishments, you can add flair, beauty, and character to your home. If you haven’t done so yet, consider a few key things about these doors including how to choose the best ones for your home. Houses tend to have several interior doors throughout them, each with usually several functions. While you may simply close the door for privacy, they also provide a bit of soundproofing. They can also play a role in terms of blocking off areas for kids to keep them safe. 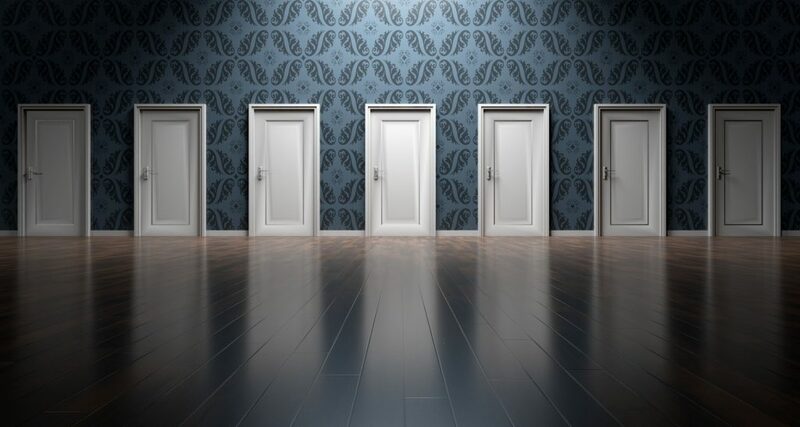 Before you make any decision to buy different doors, consider a few key things. First, what does the door need to do? Most often, people select interior doors for the aesthetics they bring. You may wish to invest in a beautiful paneled door, for example, to add some interest and dimension to the hallway. And, others choose interior doors based on cost. This can be a good place to cut costs in a significant home remodel. But, these doors do much more. For example, they provide privacy, and they help to separate the functionality of each space. Dining rooms and bedrooms, for example, have different expectations. Doors create that physical break the home needs to flow well. They can also help contain noise or block it out. When choosing residential doors, think about who will use them as well. If they are bedroom doors, you may want those designed to open and close quietly. If you are modifying your home for those who are older or differently-abled, you may want to consider double wide doors or those with enough accessibility for mobility chairs. And, think about the direction of the door swing. How will the door open properly? Also important is universal design. This is a design method that aims to meet the needs of most people. That is, it incorporates features that help to make the home accessible to all people even those who are older, a different size, or those with different abilities. For interior doors, the goal is to ensure all doors are at least 30 inches in width and have a lever-style handles. The two most common options for interior doors are flush doors or panel doors. Both options are frequently used. Choose which one you prefer in overall style and price. Flush doors are perhaps the simplest type on the market. They have a flat surface. They do not have any detailing on them nor any type of raised area. They look and feel just like a single piece of wood. These doors are very common because they tend to be very inexpensive. They are also simplistic in terms of matching them to other doors or décor in the home. They tend to be available as both solid and hollow core doors. Most are still very lightweight to allow for easy hanging and use. You can complete them with a variety of stains or even paint. Choose what matches your home. By comparison, panel doors offer more interest, appeal, and detail. Panel doors are simply doors divided into panels or different panes. They have a frame and then have panels built into them, in most cases. The panels can run horizontally or vertically. A variety of styles are available here. Most common is a raised panel door where the panels are raised off the flat surface. They can also be recessed. Panel doors can be completely wooden or have panels of glass. They can also be solid or hollow core, depending on your goals. And, like other doors, you can stain them to match your home or paint them. They do offer more dimension than a flush door. While you have some basic information about the types of doors available, don’t stop there. There are numerous styles of doors to consider. Take a closer look at some of the most popular options to determine how well each works in your home. This is the most popular type of door in houses today. They are the simplest of types. The door features hinges on one side to allow it to swing open and close. The hinges can be on either side to allow for the proper movement based on the entrance way of the room. Most hinged doors are sold pre-hung. This means the door is already hung and leveled within a frame. The frame is then added to the opening in your hallway or room entrance. Pre-hung doors are easier to install because much of the hard leveling work is already done. However, it is possible to buy hinged doors that are not in frames. In some homes, a sliding door can be ideal. Its most commonly found in homes with an Asian design to them, but works well in homes anywhere. In short, these doors slide open instead of swinging open. They move in a horizontal motion, usually by gliding along a track that’s mounted either on the base of the floor or on the upper portion of the frame. Bifold or folding doors work just like they sound. When the door is pulled open, it folds into two portions that jut outwards. This type of door is ideal for closets or in areas with limited space. A bypass door works somewhat like a sliding door, but they slide on a track along the upper portion of the door. When slid to the side, the doors overlap, minimizing the amount of opening, but allowing for no need to swing the door open. These can create more room within a space. Hidden or pocket doors are a fantastic tool when you need to save space. In these doors, the door is built into the wall next to it. A pocket in the drywall allows for the door to slide into and out of it. By being concealed, there is no need for the space a hinged door requires to swing open. Barn doors look like they’ve come from a barn. They tend to have slats or pieces of wood linked together. They create a rustic look in the home, though they do not have to be true barn doors. French doors have a unique look in that they tend to be two doors, usually with glass panes, that open up into a space. The two doors tend to open at the center where they meet, creating a large opening as they swing away from each other. Pivot doors have a unique hinge in the center of the door frame. This allows the door to pivot on that hinge to open in either direction depending on the way the user pushes or pulls the door. Dutch doors are unique and often called stable doors, such as those found in a horse stable. These doors, which are often just half-high doors, are divided horizontally in half to allow the bottom portion and the top portion to open (or remain closed) as desired. The most expensive style of door, but also the most durable, solid wood doors offer a number of benefits. They offer a variety of grain patterns depending on the type of wood used. They also offer the most noise-blocking of all doors. However, solid wood can change over time based on humidity changes. The most popular option, medium density fiberboard, or MDF, is a moderately priced option for most homes. It is an engineered wood door, which means it doesn’t warp like wood but it feels and looks like it. The door is easy to paint and does not have any grain pattern to it. A more affordable option is the hollow core door. These are made of molded composite material or plywood, but instead of being solid all the way through, the interior is hollow. The door is lighter in weight, but also allows more sound to pass through it. However, these doors are easily hung and tend to be common for lower-end budget options. They work well for any room of the home from the bathroom and bedroom to a kitchen pantry door. A bit different, solid core doors are designed like hollow core. However, they are filled with a type of wood fiber blend. They are not made of solid wood, but rather with an engineered filler product. This adds more sound protection and temperature control but tends to keep costs down a bit more than the true solid wood door. As the name implies, glass doors are those with a wood or metal frame and glass panes. It is possible to purchase fully glass doors, sometimes called frameless doors. However, they tend to be significantly harder to install. Metal and glass or wood and glass combinations are commonly available and tend to allow for more beauty and light flow through the area. Best used inside, these can be very modern doors for offices or dens. Hopefully you are in a stronger position to select the door that best fits your needs. In particular, functionality is an overlooked aspect of choosing a door. Sure, you can make do with almost any door but, when you use a door multiple times every day, taking the time to select one that offers the best experience is well worth the investment. Additionally, it is not only the here and now you need to consider. If you remain in the home for several years then requirements can change over time – perhaps bedrooms will be switched as children age and people’s physical capabilities will change. Legal Eagle Contractors is a leading contractor in Houston, TX, providing remodeling, renovation and construction services since 1978.